A master stroke of refinement by European Metal pioneers. 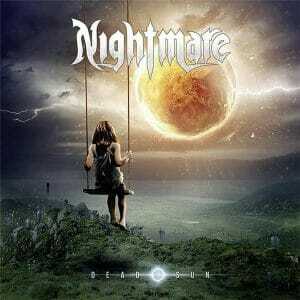 France’s NIGHTMARE is a blender of Heavy, Thrash, and Power that’s produced many classic albums over their three(!) decade run. Belgian vocal wonder Magali Luyten made her introduction in the one-and-done 2006 super group BEAUTIFUL SIN. And now her singularly powerful midrange acts as a primer in making NIGHTMARE’s ‘Dead Sun‘ one of the best damn releases of 2016. With Bassist Yves Campion as the only remaining original member this super-tooled reinvention shows off Guitarists Franck Milleliri, Matt Asselberghs and Skinsman Olivier Casula. While Producer/Mixer Joost Van Den Broek and Engineer Gerald Jans shape a thunderous, gut-punch recording that wounds. This is not your momma’s Melodic Metal. Any allusions of some foo-foo, female-fronted Symphonic/Folk is quickly shattered during the cranium crush Thrash of opener “Infected“. Maggy’s bite is absolutely as deadly as her bark! Many Euro acts drift alongside quirky English as a second language accents and less-accessible Prog tendencies. There’s none of that here. This is pure, classic Heavy Metal played with a singular purpose. Every song offers grind, tightly controlled blasts, and an appropriate mix of roar and soar. Nothing truly groundbreaking, nor offensive. Just adrenaline fueled, shamelessly balls-out steel. Stand-aboves include an almost reflective “Tangled in The Roots“, the slow-burner “Indifference“, the haunting choral cry of “Seeds of Agony“, and a relentless barrage of rhythm, shred, and melody calling itself “Inner Sanctum“. Thankfully (surprisingly! ), there’s not a ballad in sight. “Starry Skies Gone Black” ends things just as they began, all fire and brimstone. Lest we forgot that Metal, by definition, should elicit some rebellion and rage. Listening to NIGHTMARE’s ‘Dead Sun‘ won’t make you feel all warm and squishy inside. If your head ain’t bleeding by album’s end you’re just not doing Metal right. Magali Luyten’s tremendous Metal roar. “Infected”, “Inner Sanctum”, and “Starry Skies Gone Black” leave dents. Melodic masterstrokes”Tangled in the Roots”, “Indifference”, and “Seeds of Agony”.